Background: Fanny Crosby, the namesake for American Heritage Girls Pathfinder Level, was born almost 200 years ago on March 24, 1820. Due to doctor's error, she became blind when she was still just a baby; only 6 weeks old. But Fanny persevered. What does it mean to persevere? She never gave up. She kept going, kept trying, and stayed on task even when things were hard and she felt like giving up. She believed that she could do "all things though Christ who strengthens me" (Phil. 4:13). She was content despite her circumstances and praised God for her blessings. Fanny loved to write hymns, and she was very good at it. Throughout her life she wrote more than 8,000 hymns; some of which we still sing in church today. 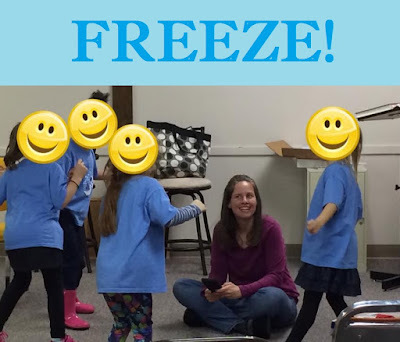 Before continuing with the lesson, play freeze dance to get all of those wiggles out. Use some of Fanny's popular hymns like "Blessed Assurance", "To God be the Glory", and/or "All the Way my Savior Leads Me". If you were blind, what challenges would you face? How could you overcome them? What are you other senses and how could you use them if you could not use your sense of sight? Would it be easy? Reading is one challenge the blind need to overcome. Between the years of 1821 and 1837, Louis Braille, a blind French youth developed a system of raised bumps that represented letters and symbols so reading could be accomplished with the sense of touch. However, it was not until 1868 when a group of British men now known as The Royal National Institute for the Blind took up the cause of bringing braille to the world. I love the teamwork the girls used to solve this! 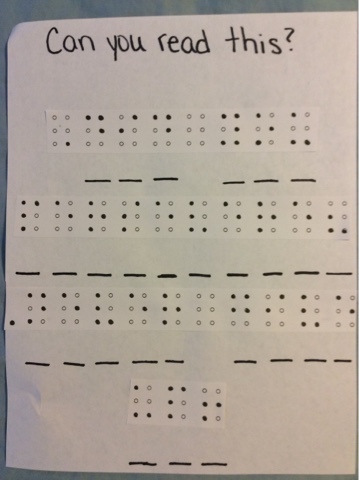 Discuss: Do you think it would take a lot of hard work and perseverance to learn Braille? 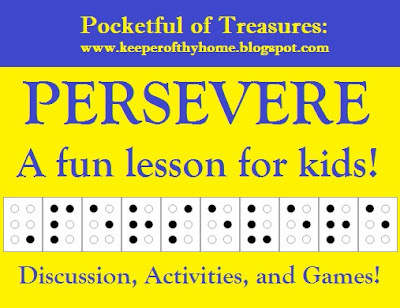 What would be the reward for persevering? 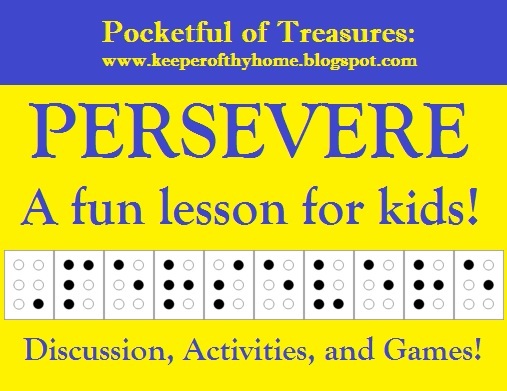 Have each student tell of a time they had to persevere. 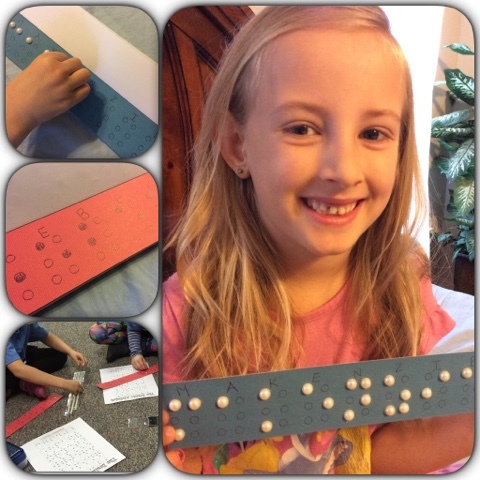 Prepare name strips with a Braille template representing the child's name. Have them glue gemstones to form their names in Braille. With eyes closed have them run their fingers over the name tape. Discuss how it feel. Have them pass around and try feeling each other's names. If you put three names in front of them, with eyes closed, can they feel out their name? Play "Fanny Crosby", similar to "Marco Polo" but on land. One child is chosen as "it" and blindfolded. For the safety of everyone, do not allow running and make sure the space is clear of hazards. Whoever is "it" yells "Fanny" and the rest of the children respond "Crosby". 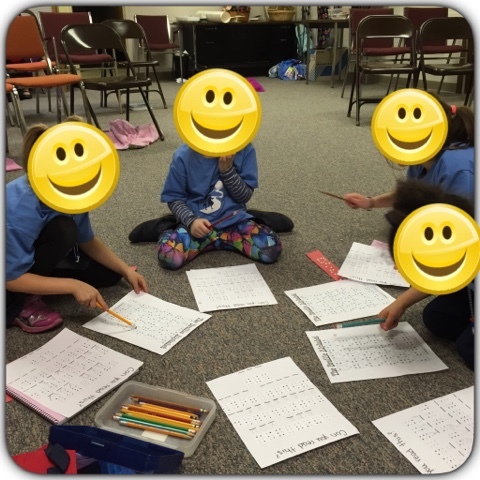 By listening, the "it" person will try to move towards the other children, with the goal of tagging them. When tagged, that person then becomes "it". Wow! The first week is almost over! I know I have been feeling lots of spiritual warfare. The devil would like nothing more than to make you feel defeated, downtrodden, and give up! Keep pressing on. Keep your eyes fixed upon Jesus. Remember WHY you are doing this journey. 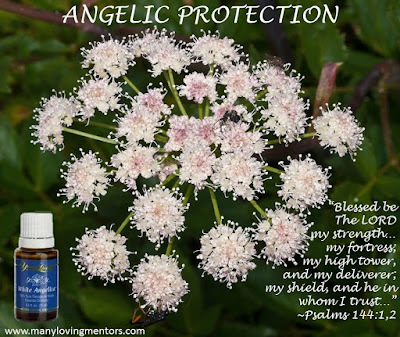 ANOINT: Apply Inner Child around navel and on chest, temples, and nose. JOURNAL: What does it mean to "receive the kingdom of God like a child"? 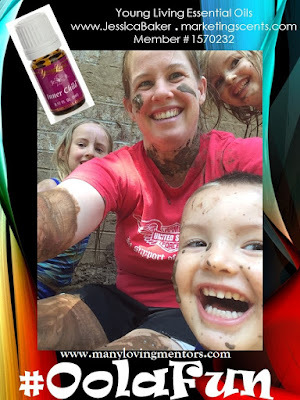 What stumbling blocks are preventing your "Inner Child" from shining? SHARE: A story from childhood that exemplifies childlike faith. ✔30+ Minutes of Family Fitness. 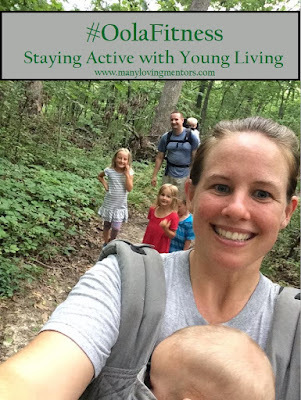 Go for a walk, play a sports game, play tag, chase, red rover, make an obstacle course... anything to help bring out that Inner Child and have some fitness fun! 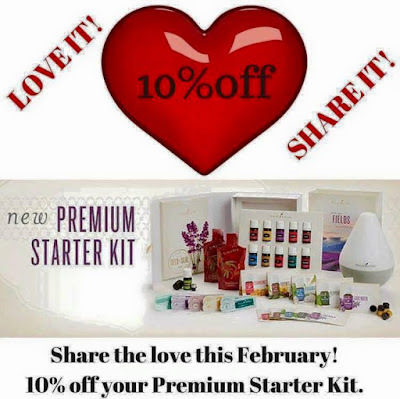 PLUS, Join in February and you will save 10%!!! Congratulations! You have survived the first week! Today we will be taking our day of rest, and spending some time with mapping out our plans for not only the second week of the wellness challenge, but the next month, 6 months, and year. 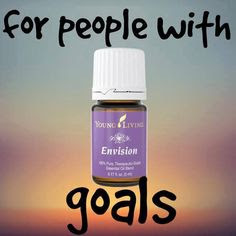 ANOINT: Apply Envision to the wrists and temples. OR, if time allows, draw yourself a warm bath. Mix 4-6 drops of Envision with Epsom Salts or a Bath Gel Base (Morning Start Bath Gel is one of my favorites) and add to the warm bath. STUDY: Read Psalm 37. Highlight the actions of the believer (i.e. "Do not fret", "Trust in the Lord", "do good".) Make a list of God's attributes and actions. JOURNAL: What are the desires of your heart? Write out 5 personal goals for the next week, 6 weeks, and year. PRAY: Be still and wait patiently. What Bible verses come to your mind? Commit your way to the Lord. SHARE: A few of your goals with the group. How can we encourage you and lift you up in prayer? ✔️Bible Study, Journal, Pray. Map out a plan for the next week. ✔️”Clean”, nutrient dense meals. Recommend "Whole 30" or Paleo type recipes. You are all doing so well! I have loved seeing everyone's check-ins of the facebook page. You can check in here by leaving a comment as well. 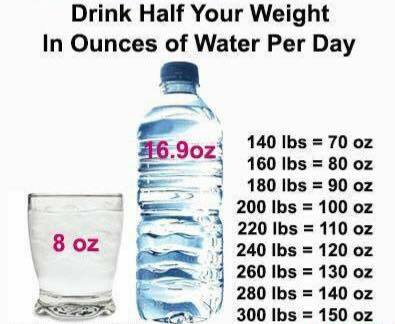 Don't forget to grab your drink of water and let's get started! 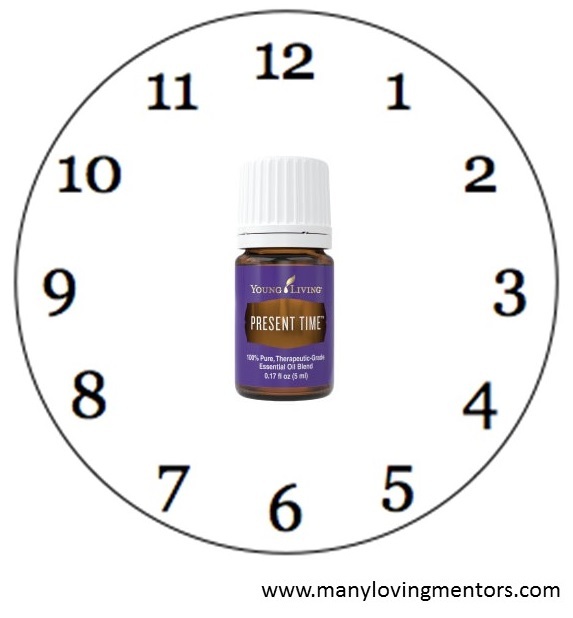 ANOINT: Apply Present Time clockwise over the thymus (down the sternum - middle front of ribs) in a circular motion; close eyes and tap three times iwht energy fingers (pointer and middle). Also apply to neck and forehead. JOURNAL: Go for a walk in the woods or look out the window. Do you see any birds? 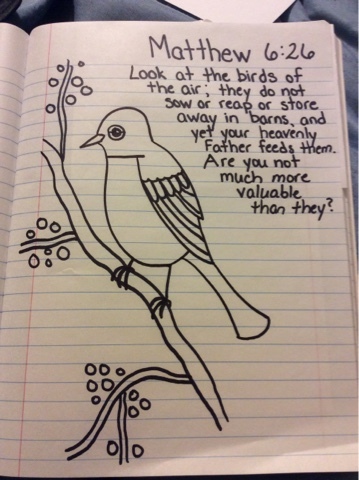 Sketch a drawing and write out Matthew 6:25-34. PRAY: Praise God for the many times he has cared for you in the past. Turn over all your worries and anxieties to God. SHARE: A way you have seen God's faithfulness, either in nature or in your own circumstances. ✔20 minute walk - can be broken up into two 10 minute walks. If possible, walk on a nature trail or through a park. 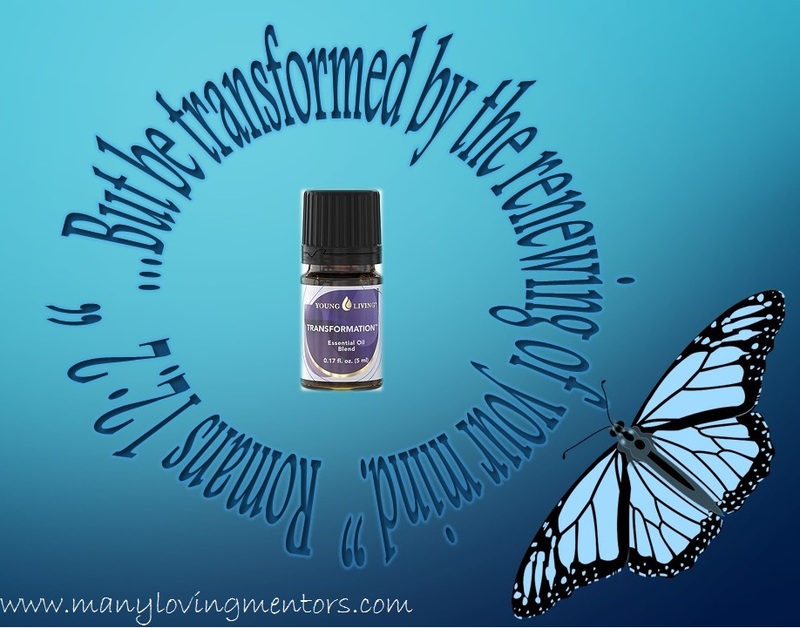 ANOINT: ApplyTransformation to the forehead ("third eye chakra") and over the heart. 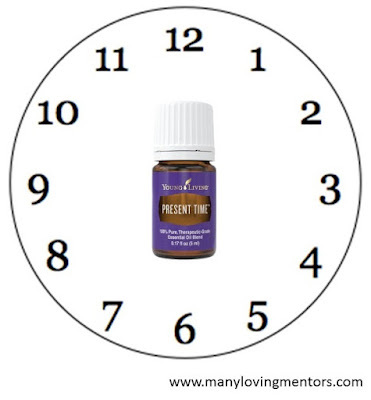 You may also diffuse this oil today. STUDY: Keeping your body in shape is a spiritual discipline and requires transforming your mind and body. Read Isaiah 43:16-29, Romans 12:2, 2 Cor. 3:18, Proverbs 31:17, and 1 Cor. 6:12-20. JOURNAL: As a Christian, what are your motives for living a life of wellness? How does it differ from a worldly view? PRAY: Pray for God to transform and renew your mind, to align your purpose and plans with His. Ask God to replace any negative thoughts (doubt, fear, negative self image, self pity, etc.) with what is true, noble, right, pure, lovely, and admirable. SHARE: Having a body that is strong and well, ready to do the work and will of God, does not necessarily mean that we need to spend hours in the gym each week. Just like we need to transform our "why" for wellness and fitness, we can also transform our "how". Think of some creative ways you can strengthen your body without exercising hours a day, and share those with the group. 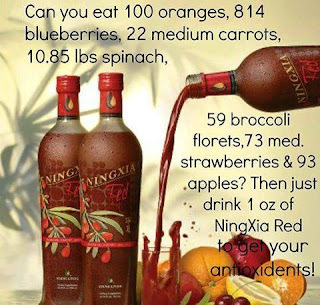 Today's exercise challenge will help you. ✔Station Challenge - Take a piece of paper (or several if you have a higher fitness level). On it write "STOP AND DROP" nice and big. Tape it somewhere in your house that you will pass by pretty often today. Today, every time you pass that sign, STOP, Drop what you are doing, and perform 5-20 repetitions of an exercise. Some examples may include push ups (or wall push ups), jumping jacks, squats, wall sit, calf raises, arm circles, burpees, mountain climbers, "hoe-downs", leg lifts, or another exercise of your choice. Place a chair by the sign if you need to do seated exercises. Working or not home the majority of the day? When you go to the restroom, do a few repetitions of an exercise. You could also come up with a system where every time you take a phone call you do a chair exercise. Get creative and be sure to share your ideas on our facebook page. I try to do 5 push ups and 5 sit ups each diaper change, leg lifts while washing dishes, squats while folding laundry, and a set of hoe downs in the morning. Occasionally throughout the day our daughter will yell "BURPEE". It is an easy way to add some strength training throughout the day. Welcome back! Are you standing strong? Defeating the enemy in prayer and pushing onward, keeping your eyes focuses on Jesus? Today we will take another look at the devil and his sneaky schemes. So drink down that tall glass of water, grab your Bible, and come join us. ANOINT: Apply Forgiveness oil around the navel with the right hand going clockwise several times and think of situations where you need to forgive yourself or others. Unforgiveness is one of the most common roots of physical, mental, and spiritual dis-ease, and important to address if you want to live a life of wellness, purpose, and abundance. STUDY: Forgiveness comes much easier when you recognize the real enemy you are fighting against and direct your battle against the true enemy. Read and write out 2 Corinthians 2:5-11. 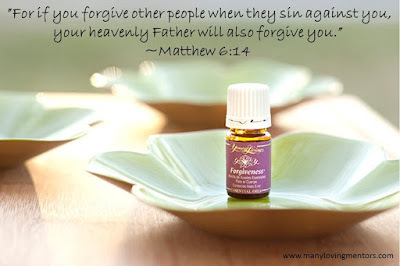 Use a concordance or blueletterbible.org to search forgive and forgiven. What are the stakes for not forgiving your brother? Reread Ephesians 6. Who is our struggle against? Make a list of people or circumstances in your life that you need to address and forgive. Forgiving is not denying that you have been hurt. It is changing our focus; making us aware of the devil's schemes and being victorious in Christ. PRAY: Pray through scripture. Praise God for the freedom that comes through Christ and the forgiveness of our own sins. Repent of any bitterness you have held in your heart. Ask for your eyes to be opened so that you may see the real enemy and be armed for battle. Speak aloud the names people that have hurt you and ask God to heal those hurts, to bring comfort and restoration. Commit to doing your part to restore broken relationships, and ask for wisdom. SHARE: In your concordance search, what other verses struck you? Congratulation! You survived Day 1 and now it is onto Day 2! 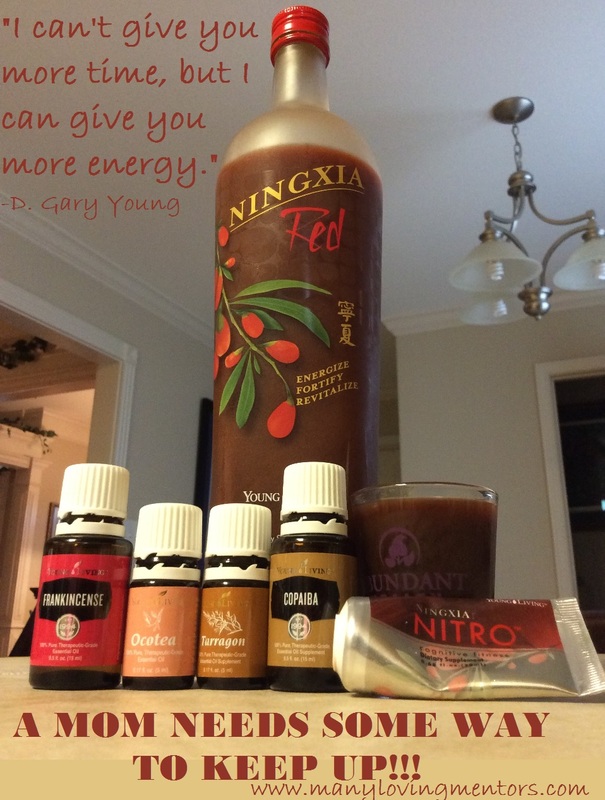 Drink down that tall glass of water and let’s get started! Do you ever feel like when you try to do good, you are suddenly attacked? I can assure you that at some point during this challenge the devil is going to try to make you lose your passion to live a life of wellness. He is going to try to magnify every little insecurity you have, spewing lies of “you're not good enough or worth it” and reminding you of every time you have failed before. Fear, anxiety, and worry will all be yelling at you, but those are schemes of the devil. We must arm ourselves and be prepared against the devils attacks! 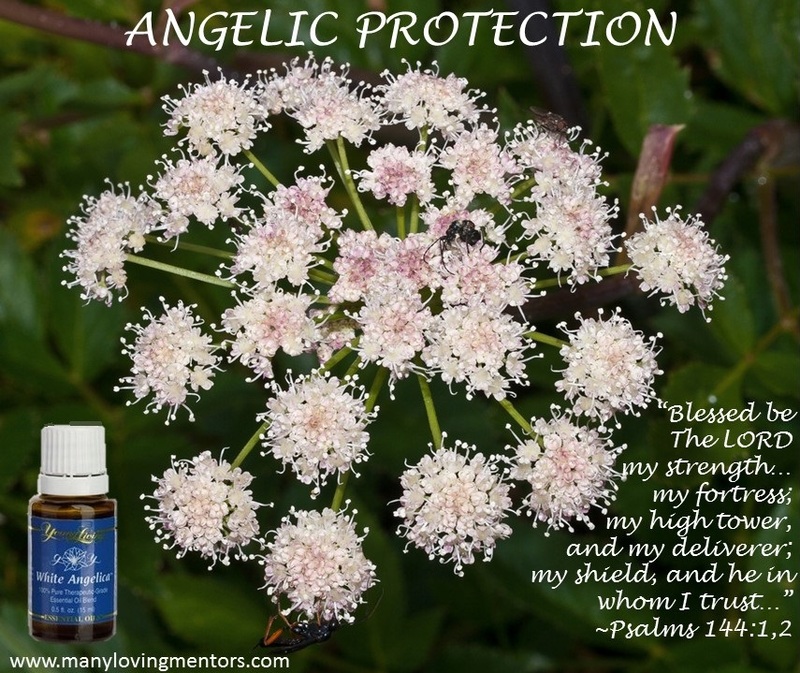 ANOINT: Apply White Angelica essential oil blend on your hands and rub it down your crown, behind the ears, down your neck, and out across your shoulders like angels wings. 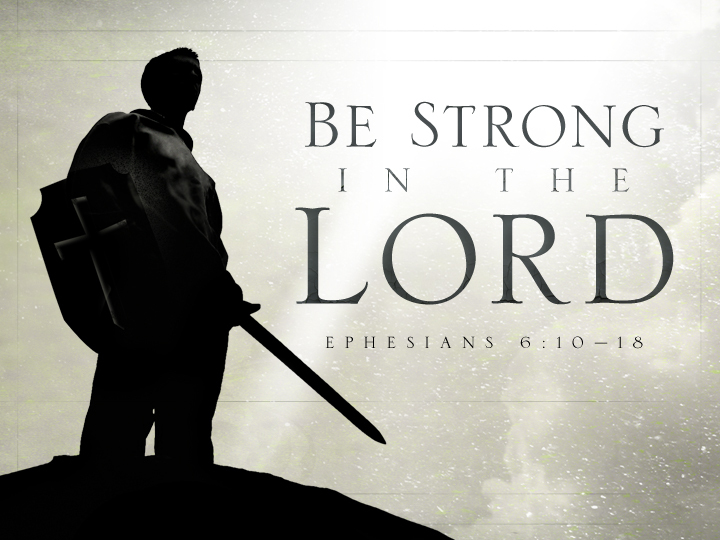 STUDY: Read and re-read Ephesians 6. JOURNAL: We are going to try some journal art. I am certainly no artist, and you do not have to be either, but I think pictures are sometimes more powerful than words. Draw yourself, and clothe yourself in the armor of God. Then draw the flaming arrows of the evil one coming towards you. What might some of those arrows look like (i.e. worry, fear, etc.). 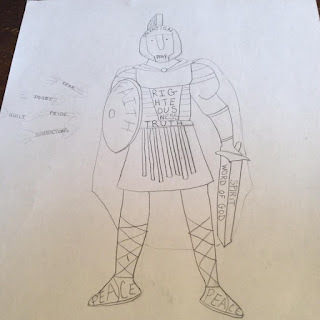 SHARE: If you have children in the home with you, share your drawing with them. 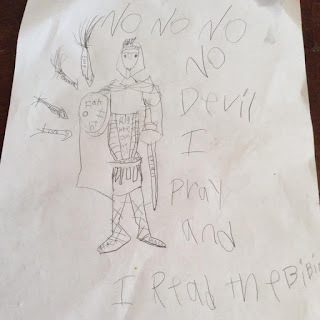 Read Ephesians 6 to them and help them make their own drawing. 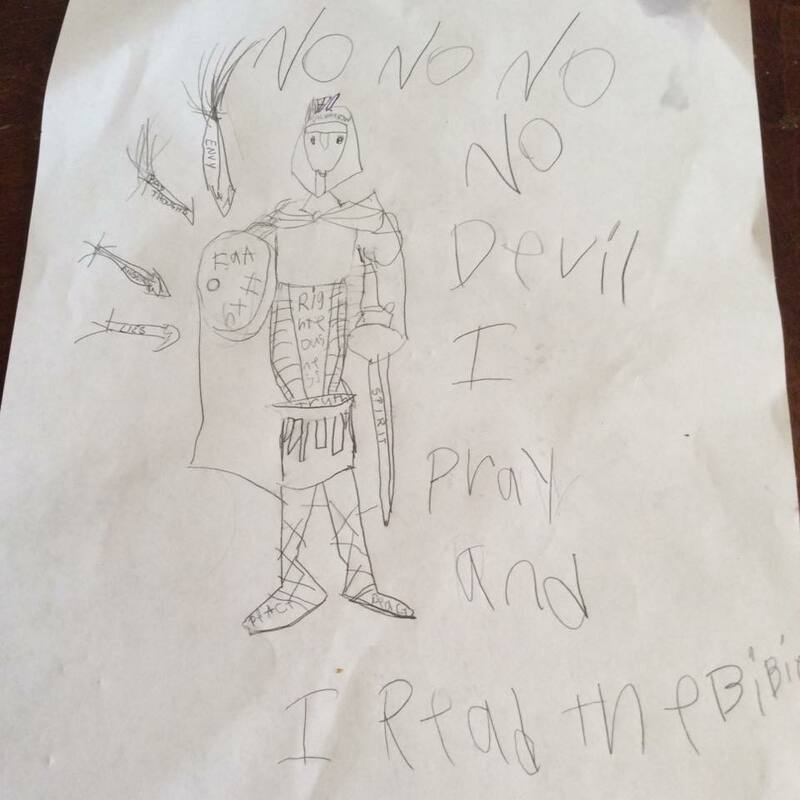 For older children you may even get a glimpse into ways they are being attacked and know how you can direct your prayers for them. 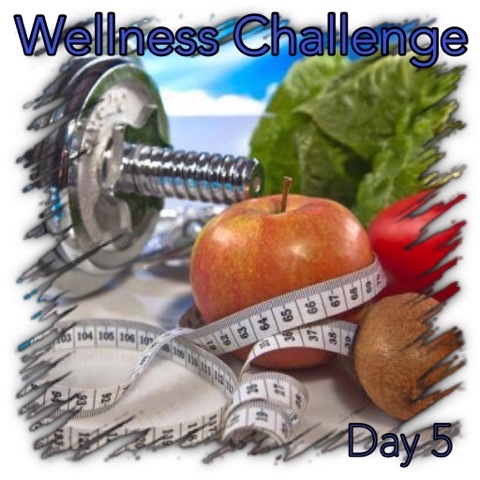 Would you also consider sharing with our group, either on the Facebook page or Instagram tag #WellnessChallengeArmor. So let's talk about dinner for a minute. The goal is to consume a whole foods meal that is nutrient dense and free of processed foods, preservatives, dyes, processed sugar (honey and maple syrup in moderation – let's not pretend that we are Buddy from the movie “Elf”!). Focus on non-GMO, whole foods. This could be as simple as baked chicken seasoned with Rosemary, rice tossed with broccoli, and a hearty salad. We will be sharing recipes and ideas on our ptivate facebook group.